Take the chore out for everyday dishwashing with the Hoover Wizard HLSI 762GT Full-size Integrated Smart Dishwasher featuring smartphone compatibility. 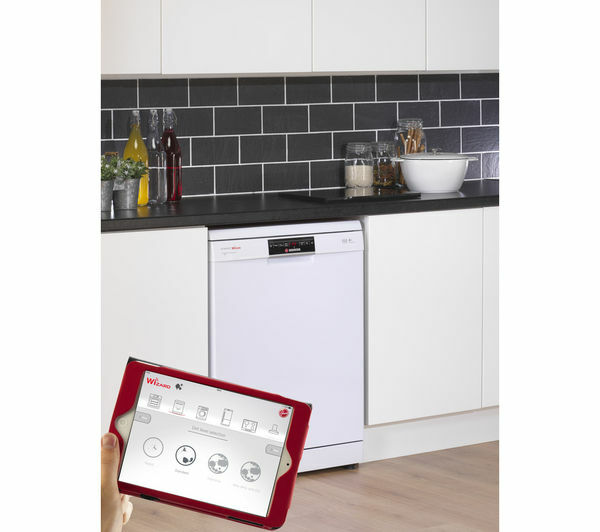 Use the Hoover Wizard app on your smartphone or tablet to enjoy complete control over your dishwasher. The app will recommend the most appropriate program based on the size and cleanliness of your dishwasher load. As result, you can reduce water and energy consumption and help cut down on wash times. The Wizard app also lets you control when you start a cycle even when you're not at home. 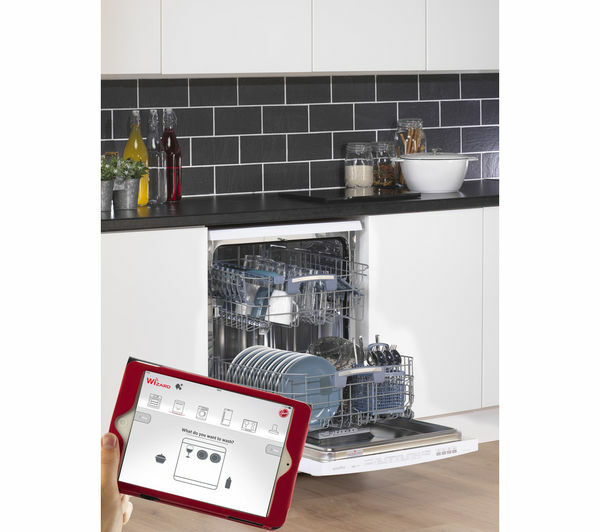 Use your smartphone or tablet to start the dishwasher and monitor how long is left on a cycle. Come home to freshly washed plates or plan dinner for when they're ready. With 12 programs to choose from, you can ensure all your washing needs are covered. Whether you're cleaning delicate glassware or burnt on food stains, the Wizard app lets you save your favourite programs to make washing even easier. The HLSI 762GT WiFi's Delay Start lets you delay the start of a cycle up to 23 hours, so you can run the dishwasher overnight and take advantage of reduced energy tariffs. Designed with larger baskets you can wash more at one time. Boasting 16 place settings and a dedicated cutlery basket, there's plenty of room for bigger loads from small plates to pots and pans. 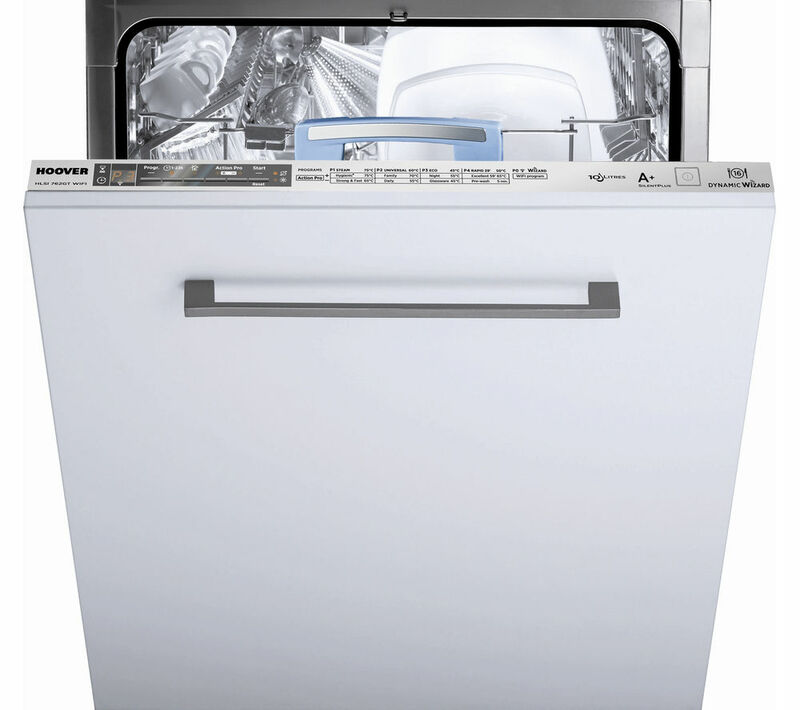 The modern HLSI 762GT WiFi features intuitive touch controls to make your dishwasher even easier to use. Set and adjust the settings to enjoy perfectly washed dishes every time. Bring your dishwasher up to date and take advantage of WiFi technology with the Hoover Wizard HLSI 762GT Full-size Integrated Smart Dishwasher. This cleans dishes really well, much better than my previous dishwasher. It is also pretty quiet. I like how easy it is to move the upper tray up and down depending on what you are loading in the bottom. Loading the dishwasher is painful, there are very few vertical spikes. The door is heavily sprung and the draws move quickly which combined with the lack of spikes means things fall over all the time. The cutlery holder is unstable, you have to load a plate next to it immediately otherwise it falls over and drops cutlery everywhere! Fairly quiet, decent enough at actualy washing dishes and fairly easy to load. The "smart" part is awful. The dishwasher constantly appears offline which makes it impossible to select a program and start washing from your smart device. Most dishwashers these days wash dishes, the smart part is an extra and really should work a lot better than this one does. Our previous Hoover lasted over 10 years, hopefully the new one will. Plenty of cycles to choose from, two smaller cutlery baskets to move whereever you choose. Various options on top shelf and plenty of room for plates and pans at the bottom. Quieter than old machine. We can also install your new appliance on the day we deliver, for most of the UK. Just add installation at the 'Confirm basket’ page at the checkout,charge applies. Check existing electrical and plumbing connections are within 1.5 metres of the appliance. Disconnect the existing appliance, remove the plinth and panel door, then un-box and check the new product. Re-fit the plinth and panel door to the new appliance. Note: Before we arrive, you will need to make sure access is clear, that the appliance is an identical size to the one it is replacing, that it will fit into the existing space and to the door panels. Plumbing and electric connections must be within 1.5 metres.